Have problems when trying delete multiple contacts on iOS? If your iPhone, iPad or iPod address book is full of useless contacts, you may want to remove them at once. However, in the current version of iOS, there’s unfortunately no simple way to swipe and delete a bunch of contacts at once. But there’s an easier way than going one by one through the contacts on your phone. The first method is through Syncios iOS Mangaer ( Free ) . 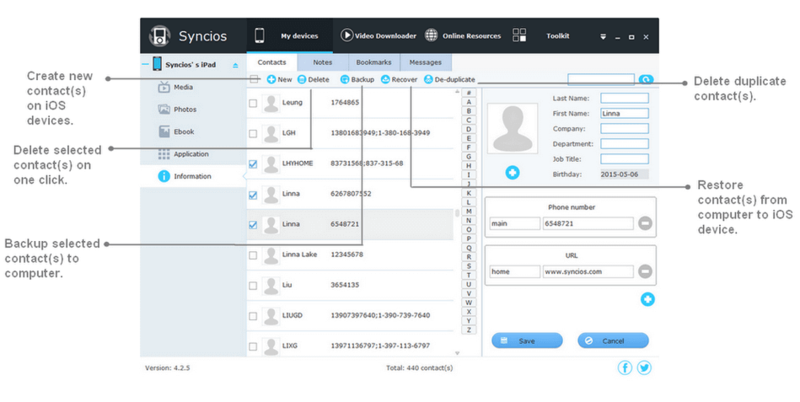 This software offers offline backup of your contacts list and merger duplicated contacts, along with an easier way to delete a large number of contacts selectively or in batch. It makes mass deleting contacts easy — you can even apply a filter to search for a specific name or number. It offers both Mac & Windows Version. Step 2: Navigate to My devices > Information > Contacts. Select multiple contacts you'd like to delete on your iPhone from middle contacts list and tag Delete. Tips: you are able to hold down "Control" key to select several contacts. To select all contacts, tick the first checkbox on the top. Congratulations! You have removed those unwanted contacts successfully. You’ll keep your contacts this organized all the time now. But...wait! what if i got lots of duplicate contacts on my iOS device? Should i delete them one by one? The answer is "No", if you have Syncios iPhone Manager on your computer. Now check out following steps to delete duplicate contacts at ease. Connect your iDevice to PC and launch Syncios iOS Manager. Click on My devices > Information > Contacts. Tag on De-duplicate button to remove all of duplicated contacts on your iPhone/iPad/iPod. Note: All iOS devices are supported by Syncios iOS Manager. They are: iPhone 4S/5c/4/5s/5c/5/3GS, iPhone 6s/ 6s plus, iPhone 6/6 plus, iPod touch 5/4/3, iPad with Retina display, iPad mini, iPad Pro, iPad Air, The New iPad, iPad 2 and iPad. Thank you for free offering such an awesome program! It takes only 1 minute to transfer 750+ contacts from my iPhone 6 to laptop. Contacts were backed up with e-mail address, personal infor, b-day, etc. Impressived! I used to delete some useless contacts on my iPhone one by one. It hassled me a lot. The app was recommended to me by a friend and I was under the impression after downloading it that I would be be able to remove contacts in batches. Amazingly fast and secure! The most importance is that it is Free! Thank you for providing such an awesome free to use software.